Here's another one of the Japanese dishes I originally posted on Facebook. As I look at the photos, it makes me want to make this again, even though I just made a big pot of Nishime for New Year's Day. My mother's family loved Nishime and made it often, my grandfather being the cook in the family. My mother learned how to cook from him, and we ate this a lot when I was little. The Nishikawas made it with chicken wings, which give it a flavorful broth, and added konnyaku and takenoko, traditional Nishime ingredients. It gave me a nice feeling of happiness to see my mother enjoying the Nishime on New Year's Day. I make it my own, turning it into a vegetarian dish, and omitting the ingredients I ate around as a kid. I find myself still eating around the konnyaku and takenoko! Yup, I'm going to make this again. It looks really good to me, since that's exactly how I like it! With the weather turning cooler this week, I decided to make one of my favorite Japanese dishes, nishime. It's a simple Japanese stew made with an array of veggies. I used daikon, carrots, shiitake mushrooms, renkon (lotus root), konbu (those little diplomas), sugar snap peas, sato-imo (Japanese potato/taro) and thin strips of age (strips of fried tofu). And kabocha, Japanese pumpkin. The secret to cutting the kabocha--because it's really hard--is to poke a couple of small holes in it with a pumpkin carving knife (the kind you use at Halloween)and microwave it for three or four minutes. That should soften it up enough to cut it. You'll need dashi to flavor the soup. I used shiitake dashi as well as konbu dashi. If you're not vegetarian, I would use the box in the middle instead of dashi-no-moto because it doesn't have as much msg. After reading the fine print with my glasses, the shiitake and konbu dashi contain a little bonito powder, so I'm still looking for a good veggie dashi. This is the one I use now. 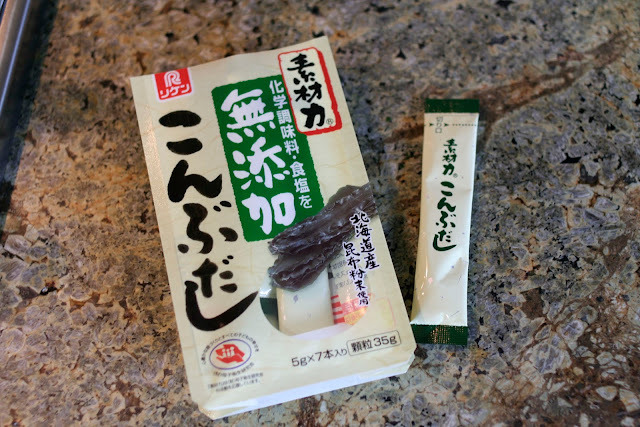 Reading the ingredients on the back of the package (they're written in English on a sticker), the first ingredient is konbu seaweed extract, not salt, like most all other dashi packages I've seen. I liked it so much I put it in my Christmas gift baskets! Peel and cut the daikon into bite-sized pieces. This is a small-ish daikon. I saw some really huge ones the other day at Nijiya Market. To make sure they're fresh and not pithy inside, look for daikon that has the greens still attached at the top and they're not wilted. This is a ceramic peeler. It's great! Cut the peeled daikon in half, then quarter each half. Cut the veggies into any shape that suits you. Peel and cut the carrots too. Cover the daikon and carrots with water and bring to boil. Reduce heat and simmer. The carrots and daikon take the longest to cook, so they go first. This is sato imo, Japanese potato. 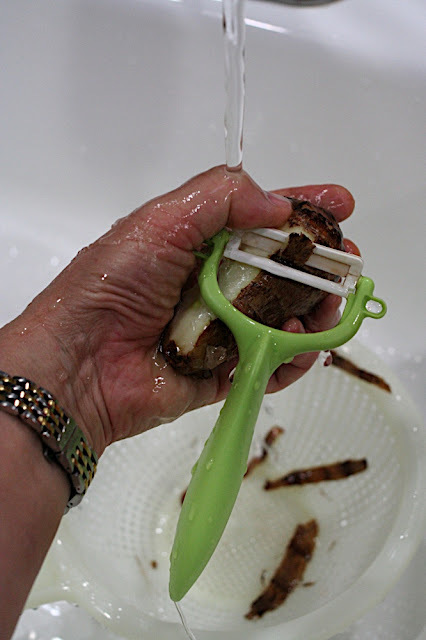 Peel the sato-imo under running water so your hands don't get itchy, or you can wear gloves. My hands don't get itchy, buy my mother's do, so best to be careful. Now they look like potatoes. 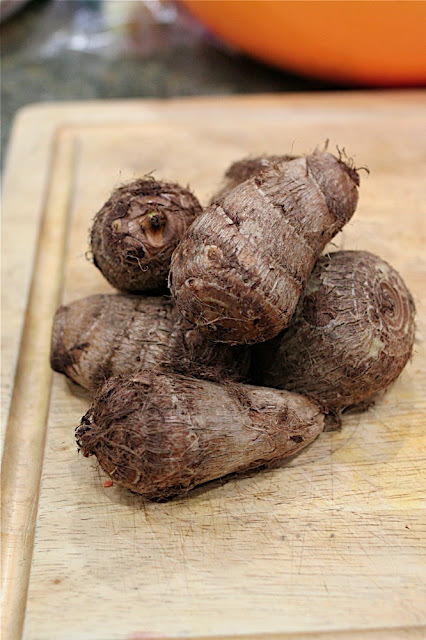 Cut them into bite-sized pieces and place them in a bowl with water. This is renkon (pronounced more like len-khon). It's lotus root. One eats this vegetable on New Year's Day so one can "see the future" through the holes. Cut the renkon in half and slice about 1/4 inch thick. I saw these little quickie nishime konbu in the market and thought I'd try them. Saves a lot of time to buy them already made. You can also use konbu that's simply tied in a knot, those are good too. They cook pretty fast. I guess that's why they're called Quickie Nishime Konbu! Coarsely peel and seed the kabocha pumpkin, then cut it into bite-sized pieces. Then cut the shiitake mushrooms into bite-sized pieces as well. I like to cut them in half, since I want a good bite of shiitake. For the sauce flavorings, you'll need 2 T mirin, 1 T shoyu (I used the raw nama shoyu, but kikkoman is good too), 1 T sugar, 1 small pkg each shiitake and konbu dashi. 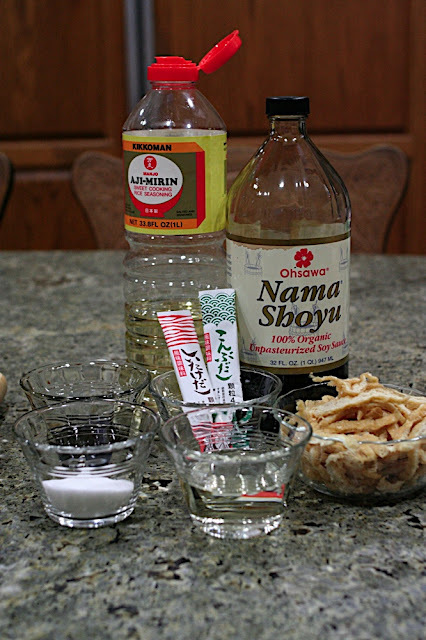 If you use dashinomoto, use 1 T. I used about half the package of the cut age--fried tofu strips. For the sugar snap peas, remove the strings and place into boiling water for about 30 seconds. They're done when they turn a bright green and you can see a subtle change. Immediately drain & rinse in cold water. Garnish your bowl with the peas. If you add them to the pot, they will lose their pretty green color and lose their snap. Add all the rest of the ingredients--except the peas-- to the pot, bring to a boil, and simmer until the potatoes are done, stirring occasionally. Okay, here's a key to making this good--taste the broth and adjust the flavors. If you like it sweeter, add a teaspoon more sugar. If you like it with more shoyu, add a little more. If it's too strong, add a little water. Adjust the aji (flavoring) so it tastes good to YOU! And people are really happy when I share it with them so they don't have to cook dinner! Serve with the sugar snap peas as garnish and with a bowl of hot brown rice. Karolyn, YOUR BLOG LOOKS GREAT!!! The pictures are so beautiful. Awesome lighting. All my favorite veggies. Think this is my favorite, so far. Preparing the dish is quite moderate in difficulty. The only problem I think that will be visible is how to carve the perfect pumpkin slabs. Fortunately, Japanese pumpkins are softer. It's me Bette Morinaka. Loved your blog...and then as I was reading...to my great surprise it was YOU! Thank you for sharing your nishime recipe. I'm working with Laura on our Oshogatsu menu for the past couple of days. So wonderful to see Karen and Rick too..and Congratulations on Karen's marriage. Omedeto-gozaimasu to you. Happy 2012! This is so helpful! Thank you. My friend bought me some Nishime at a local Jtown grocer and it was so delicious I was curious about making it.